Visible Ink Press : This superheroine has two origin stories: one of them has her as a surviving member of a mob family. This superheroine has two origin stories: one of them has her as a surviving member of a mob family. She was portrayed twice on TV by actresses Barbara Joyce and Ashley Scott. Her solo comic book series lasted only 19 issues. Her preferred weapon is a crossbow. In her other origin story, she is the daughter of Batman and Catwoman. Borrowing her name from a relatively obscure Golden Age villainess, the heroic Huntress first appeared on "Earth-Two"--the parallel world onto which the 1940s incarnations of DC Comics' characters had been relegated--in All-Star Comics #69 (1977). Envisioned by writer Paul Levitz and artist Joe Staton as the Earth-Two Batgirl, the Huntress is more intriguingly distinguished by her parentage: She is Helena Wayne, the daughter of millionaire Bruce (Batman) Wayne and rehabilitated criminal Selina (Catwoman) Kyle. Helena had recently graduated law school when a former associate of Catwoman's blackmails Kyle back into her feline guise for a heist. Catwoman perishes in a consequent conflict, leading her traumatized husband to burn his cape and cowl in a grim funeral pyre, retiring his Batman identity. Helena swears vengeance against her mother's killer, taking a vow that eerily mirrors her father's some decades prior, and becomes the Huntress, a violet-and-black-clad crime fighter who carries on the traditions of her parents with athletic prowess and crossbow in tow. The Huntress so enthralled DC readers fascinated by the heroine's lineage and motivation that she spun out of All-Star Comics into a successful backup series in Wonder Woman, until being defeated by an unstoppable menace: Continuity revision. In 1985, DC Comics streamlined its multiple worlds and their respective character variations in its highly acclaimed twelve-issue series Crisis on Infinite Earths. Since that series eliminated the Earth-Two Batman, the Huntress was also erased from comics reality. But the character was too popular to fully jettison from the DC universe, and in April 1989 was reintroduced in The Huntress #1. During her childhood, Mafia princess Helena Rosa Bertinelli's family, a Gotham City crime cartel, was executed in a syndicate hit. The sole surviving Bertinelli, Helena forsakes her gangland roots and takes up a quest to dismantle organized crime as the Huntress, aiming her crossbow at the city's mobsters. By day, she works as a teacher, further toiling to undo some of the damage caused by her family ties. The Huntress' brutal (but nonlethal) methods attracted the attention of Batman, who initially regarded her as yet another plague on the streets of Gotham, but after several encounters the Dark Knight accepted her as an ally. 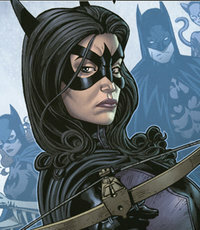 The Huntress was canceled after nineteen issues, but the heroine has maintained a profile through numerous guest appearances in other Batman titles, a membership stint in the Justice League, the issuance of several action figures, and a partnership with Oracle and Black Canary as the Birds of Prey. The Huntress even tangled with Twentieth Century Fox's murderous movie monster in the Dark Horse Comics/DC Comics four-issue crossover comic Batman vs. Predator II: Bloodmatch (1995) and was revisited at the hands of writer Ivory Madison in Huntress: Year One (1999), which tells the superheroine's origin story. The Huntress has also ventured onto the small screen. 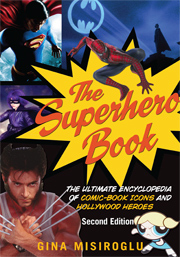 Actress Barbara Joyce played the character in two 1979 Legends of the Super-Heroes live-action comedy specials airing on NBC, also starring Adam West as Batman and Burt Ward as Robin. In 2002, a short-lived Birds of Prey series ran on the WB network, including in its cast Ashley Scott as the Huntress. While this program adapted the contemporary Birds of Prey comic book into episodic television form, it borrowed the Huntress' heritage from the Earth-Two comic-book incarnation, as evidenced by the show's tagline: "Batman's Little Girl Is All Grown Up." She has also appeared in animation in both Justice League Unlimited and Batman: The Brave and the Bold.